I love all sorts of fruits out there (okay, most of them), but I was never a big fan of them when cooked, especially jams. Other than marmalades, which are the only fruit conserve that I have constantly and positively liked, I would never really be tempted to grab one of those typically large jars of jam on the store shelves, let along making one myself. Recently, I have been playing around cooking different kinds of fruits (such as roasting them and baking them into cakes) and actually enjoying them a lot. I now even think of making a jam - or something like it. I realize that making a jam is a good solution when you have a bunch of fresh fruits that are becoming overripe and you need to use them up quick. That said, I don't want to give my fruits an overdose of sugar, so my compromise is to make low-sugar or even sugar-free quick jams. First thing that I made in this recent series of my jam making experiences was a spiced peach jam. 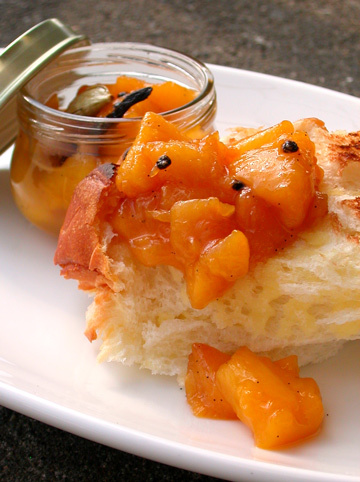 I had one large yellow peach that was almost about to be spoiled, and I remembered this one recipe (in Japanese) for spiced peach jam that I had found a long time before. With this recipe, you cook chunks of peach with a little honey and juice of lemon as well as spices (she uses vanilla, cinnamon, and cloves) only until the cooking juice is reduced and thick. It doesn't call for sugar or long cooking time, and you don't need to sterilze a storage jar, because the jam has to be consumed within a couple of days, anyways. So this is something you should make in a small portion and to enjoy the natural flavor and sweetness of a fruit, rather than for the purpose of preserving it. For my jam, I spiced it up with a vanilla bean and cardamom pods. 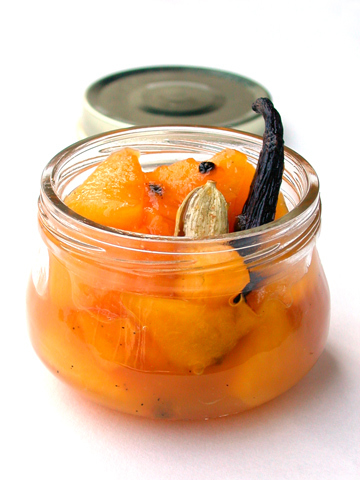 I think cardamom added a clean and refreshing feature to the ripe and sweet cooked peach. As I was happy with my peach jam, I tried on other fruits at hand using the same method (cooking with honey and lemon juice, plus some extra flavors). I took a couple of ripe figs and paired them with rosemary. 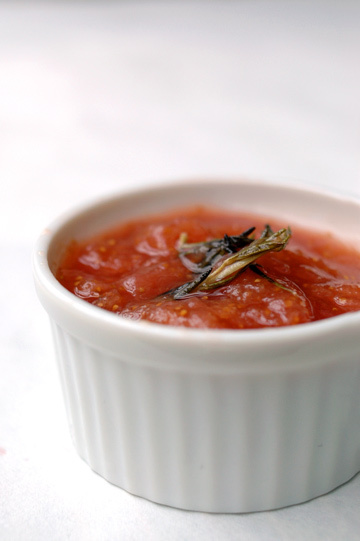 The combination of fig and rosemary is something I am so addicted to these days, and it was great in a form of jam, too. It was delicious alone on toast, but I served it with some cheese.. I tried mascarpone and gorgonzola, both of which have been known to go well with figs (actually, figs have a high affinity to many kinds of cheese...). Although I love figs with mascarpone, here I think the blue cheese was a winner of the day; the concentrated sweetness of the fruits needed an equally powerful partner to go, perhaps. 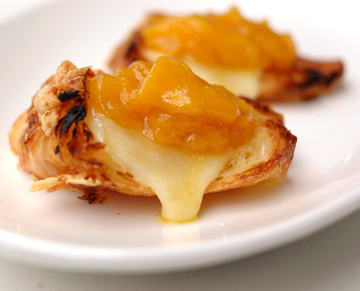 I also tried a mango jam on another occasion, using lime and ginger and served on slices of good cheese croissant and cheddar. 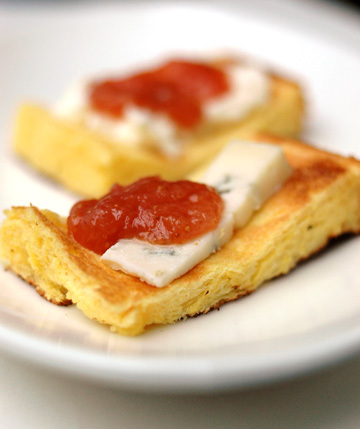 Here the saltiness of the cheeses provided a nice contrast to the sweetness of mango, making a nice, light snack. It is only in the last couple of years or so that I have started looking on the bright side of jams (thanks to some good jams out there, such as ones by Christine Ferber and June Taylor), and being able to enjoy genuine goodness of fruits and/or unusual combinations of fruits with spices/herbs in them. The more new kinds I see, the more I am tempted to try... now, how I wish they are available in a smaller portion so that I can sample more kinds; after all, jams aren't something I would want to eat everyday, and if/when I get a regular-sized jar of jam, I'd find it a bit too much for me to finish all up. I wonder if I am the only one who's saying such a thing? You're not the only one avoiding the regular-sized jars when it comes to jam! I'm a variety kind of person, so I'm not one to stick to one kind of jam. I tend not to finish the big jars too and have to throw them out when they expire. So now I only buy when I see the petite jars that come a few in a pack as samplers. do u mind sharing the receipe? Good subject; I too, like the idea of the fig and rosemary. The combination of flavors sound delicious. I have recently re-discovered apple butter and enjoy that on a nice piece of toasty bread. I wouldn't know what to do with one of those larger jars of preserves. I go in sweet spurts! being fortunate enough to have tried your homemade marmalade, i can see how other conserves would pale in comparison. you know i am a fan of all your photos, but i think the first photo could be one of my favourites, ever. i look forward to trying out the recipe as well. Nice combinations, wonderful tastes and great photographs. Thanks for the cardamom and rosemary ideas. Just before reading your blog I read another peach recipe from The Red Kitchen . It was yummy too. I wrote a comment to her post about a salad sauce I made. As I read your recipe I thougt that you would like it too. My blog is in Turkish so let me summarize the post: I cooked peaches with ginger, currant, cinnamon, carnation, black pepper, soy sauce, balsamic vinegar, a little bit of brown sugar and onion to make this salad sauce. I hope you like it. Hi, first time i visit your site but i'm sure i'll be back! Beautiful pictures and great ideas. I too discovered jam making very recently (only a year) but i love it! I also don't like them very sweet and love to make all kinds of combinations. My most recent, based on one I tried at a B&B in Canada, pumpkin, orange, lemmon and ginger. Since i live in Miami, i'm going to try with all the tropical fruits i can find! I'd like to get any ideas for interesting combinations. How about a traditional japanese recipe?